This is a post I never thought in my wildest dreams I would make. But one of the unlikely has happened. 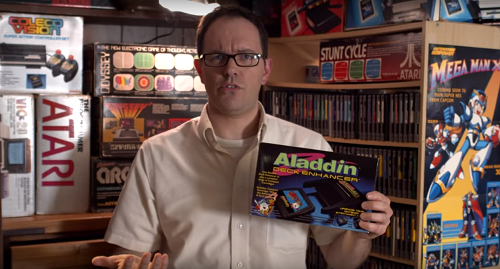 The Angry Video Game Nerd (AVGN) has briefly reviewed Dizzy through the controversial Aladdin Deck Enhancer for the NES. Even though we disagree with the Nerd's views on Dizzy, you can watch the 167th episode that reviews the Aladdin Deck Enhancer on his YouTube channel. I thought he was funny; kinda like a younger version of Victor Meldrew. Definitely not a Dizzy fan, but he does have a point about rolling off the end of a boat when jumping onto it, and getting killed by a trap that wasn't even shown on screen when you only have one life and no save points. But, regardless, Treasure Island Dizzy was my first, and still is, my favourite of all the original games. I also remember spending many sad weeks attempting to finish the game quicker than my previous attempts. I am of course referring to the Atari/Amiga versions - I never liked the Spectrum ..which is why I tend to take the mickey out of it in some of my games.